A raft of smartphone market analyst numbers are out and they all continue to make very pleasant reading for Samsung — the maker of the Galaxy range of smartphones — underlining the success of the Korean company’s strategy of steamrollering the competition by offering an extensive portfolio of mobile devices at a variety of screen sizes and price points vs. the handful of iPhones Apple offers. Android OEM Samsung retained its number one smartphone maker position in the quarter and shipped more than double the smartphones of second-placed Apple, according to the analyst figures. ABI Research has Samsung shipping 55.5 million smartphones in Q3 2012 to grab a record 35 percent marketshare, versus Apple’s 26.9 million smartphones (and 17 percent marketshare). ABI said Samsung posted almost double the year-on-year growth rate of Apple, enjoying a 109.2 percent YoY smartphone shipment bump, compared to Apple’s growth of 57.6 percent YoY. 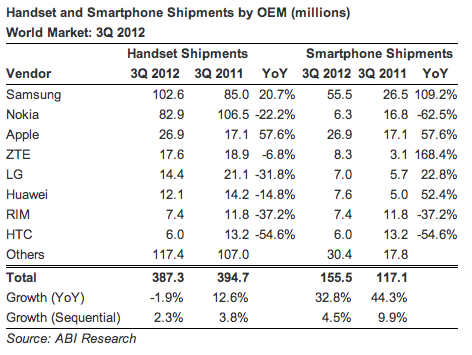 The next four largest smartphone makers in the quarter — Nokia, HTC and RIM — all posted large YoY shipment declines. Nokia was pushed out of the top three global smartphone vendors for the first time, while rising star — Chinese mobile maker ZTE — posted the most impressive growth of all the smartphone makers tracked: shipping 8.3 million smartphones in Q3, up from 3.1 million in the year-ago quarter, to achieve YoY growth of 168.4 percent. Samsung’s worldwide shipment volumes for the quarter are the largest number of units ever shipped by a smartphone vendor in a single quarter, Strategy Analytics added. Analyst, IDC, pegged Samsung’s Q3 smartphone shipments at 56.3 million versus Apple’s 26.9 million — giving Samsung marketshare of 31.3 percent, just over double Apple’s 15 percent. 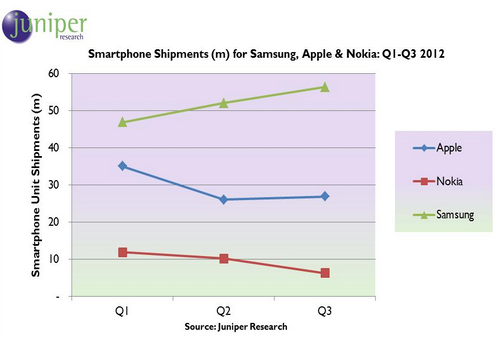 Analyst Juniper also reported 56.3 million smartphone shipments in Q3 for Samsung vs 26.9 million for Apple. Juniper said Samsung’s flagship Galaxy SIII device played “a key role” in Samsung’s record quarter — with estimated sales of 18 million for the device in Q3. “The Galaxy SIII has been a phenomenal success for Samsung this year, bettering its sales over the previous quarter. Samsung has been highly effective in leveraging its global brand strength and the popularity of the Android OS to drive sales of smartphones in all price tiers,” the analyst noted. Nokia remains in the doldrums thanks to the Finnish mobile maker’s Windows Phone-based devices not making a significant impact, it said — noting Nokia shipped just 6.3 million in Q3 — a 63 percent fall compared to Q3 2011. 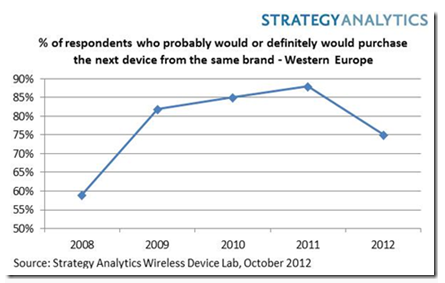 In a separate report on iPhone owner brand loyalty, Strategy Analytics also noted that the number of iPhone owners who say they definitely will or probably will purchase their next phone from the same brand has declined in both the U.S. and Western Europe for the first time — dropping from 88 percent in 2011 to 75 percent in 2012. The analyst says a key factor in this decline is rival smartphone makers offering devices with larger screens than the iPhone. Strategy Analytics research last year showed 4.3 inches as the most preferred size, while “early provisional” results from an update to this research suggest 4.5 inches may be the most preferred size for respondents surveyed from June-December 2012. Despite this drop in brand loyalty, the analyst notes that Apple retains a higher repeat purchase intention level than any other major phone manufacturer it surveyed. Respondents who say they probably or definitely will not buy their next phone from Apple is “low”, it adds.